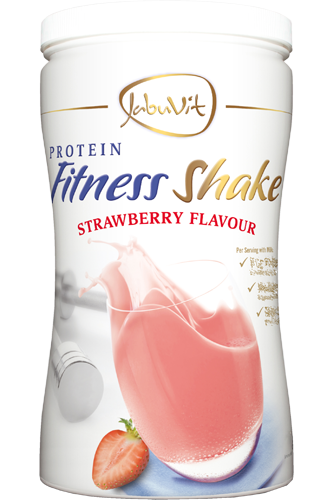 The Protein Fitness Shake from JabuVit contains valuable proteins, making it particularly suitable as part of a figure conscious diet. The JabuVit Protein Fitness Shake is the delicious and wholesome energiser for all those who enjoy jogging, walking, cycling, swimming, going to the gym and who want to call body-conscious nutrition and a sporty body their own. So, only the highest quality ingredients have been added to the shake. The powder can be mixed either with water or skimmed milk, creating a creamy shake based on the valuable sources of protein whey, soy and egg. Due to this combination, the Protein Fitness Shake attains a very good amino acid ratio and a high biological value of 138*. It is ideal in providing muscles with amino acids before and after exercise and thus in promoting regeneration. The creamy shake is easily digestible and has an extremely delicious taste. Valuable protein blend of whey, egg and soy. Since proteins contribute to the build-up and maintenance of muscles, athletes who perform high intensity workouts and who wish to have more muscles, especially benefit from these valuable sources of protein. The Protein Fitness Shake from JabuVit is also suitable for people, who have little time during the day for regular meals because of their professional situation. Whether as a snack during a carbohydrate reduced, protein rich diet or to cover any additional protein requirements - a healthy protein meal is available in no time due to its simple preparation. This keeps the metabolism balanced and helps to maintain muscles. Since the proteins spend varying amounts of time in the stomach, the shake can be enjoyed at any time and has the right sort of protein available for any given situation. In addition, the powder has excellent solubility and the finished shake is especially well tolerated. The JabuVit Protein Fitness Shake also provides minerals, such as magnesium, potassium, calcium and phosphorus, which are mostly sweated from the body during sport. These minerals are derived from natural protein sources. Which products can the JabuVit Fitness Shake be combined with best? In combination with the Body Attack Daily Vital, a multi-vitamin mineral supplement that provides micro-nutrients involved in various bodily functions in the human metabolism. With the Body Attack Calcium + D3 tablets, a mineral with vitamin D, that contributes to maintenance of normal bones. With the Body Attack Omega-3 fatty acid capsules, essential fatty acids which, like vitamins, the body is unable to produce itself. *The biological value specifies how many grams of endogenous protein can be formed from 100 g dietary protein. The value 138 refers to the chocolate flavour. Ingredients (Chocolate flavour): Whey protein concentrate (49%), Soy protein isolate (35.3%), Cocoa powder (7%), Flavouring, Corn starch, Sweet whey powder (1%), Hen egg white protein powder (1%), Instant caramel (Caramel sugar, Maltodextrin), Thickener (Guar gum), Emulsifier (Soy lecithin), Sweeteners (Acesulfame K, Sodium cyclamate, Sucralose, Saccharin), Table salt, Seperating agent (Silicon dioxide). Directions: Novices: Stir 30 g powder (3 scoops) in 300 ml of low-fat milk and drink immediately after training. Intermediates: Stir 50 g powder (5 scoops) in 250 ml of low-fat milk immediately after training. On non-training days consume as required 30 g or 50 g of the protein powder between meals. Do not exceed the recommended daily dosage.